In order to use the Artwork Approval feature in Control, you must first run the Artwork Compatibility test. To learn more about this test, click artwork_approval_compatibility_requirements. If the Artwork Tab doesn't appear on the Order or Estimate, check for a solution artwork_tab_doesnt_appear. After running the Artwork Compatibility test and selecting your artwork approval monthly plan, please click the Enable Artwork button. 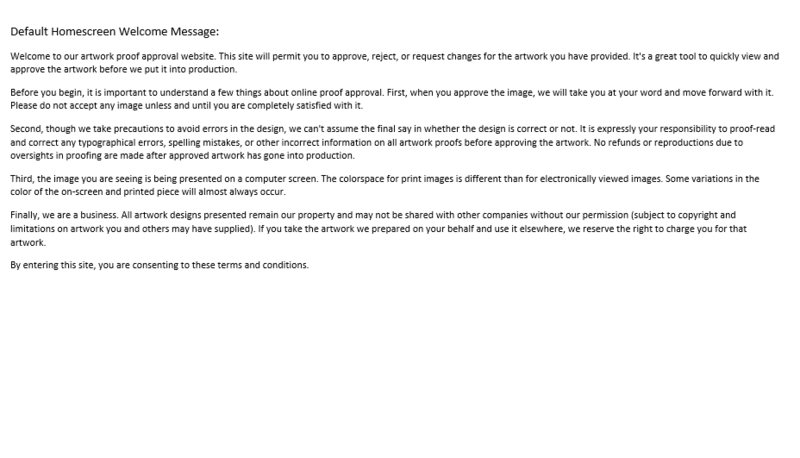 This will open the Setup options for Artwork Approval. 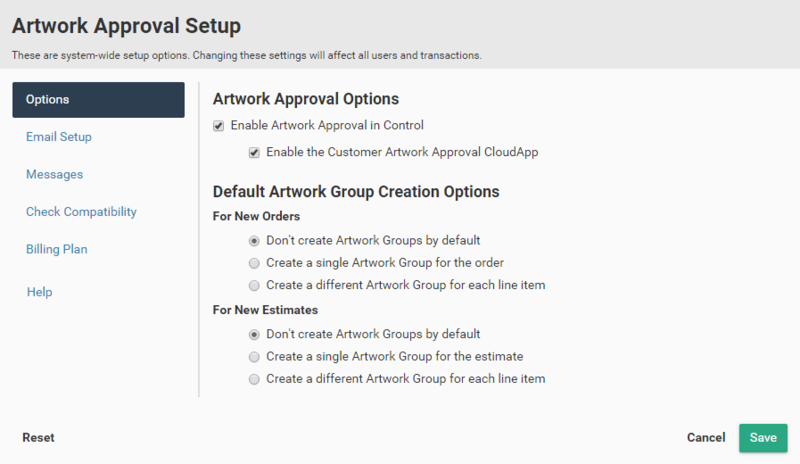 It is recommended that you set these options up now so that you can start using the Artwork Approval feature. On any order or estimate, click the white Gear icon in the top right hand corner of the Artwork tab. This will display the Artwork Approval Setup options. 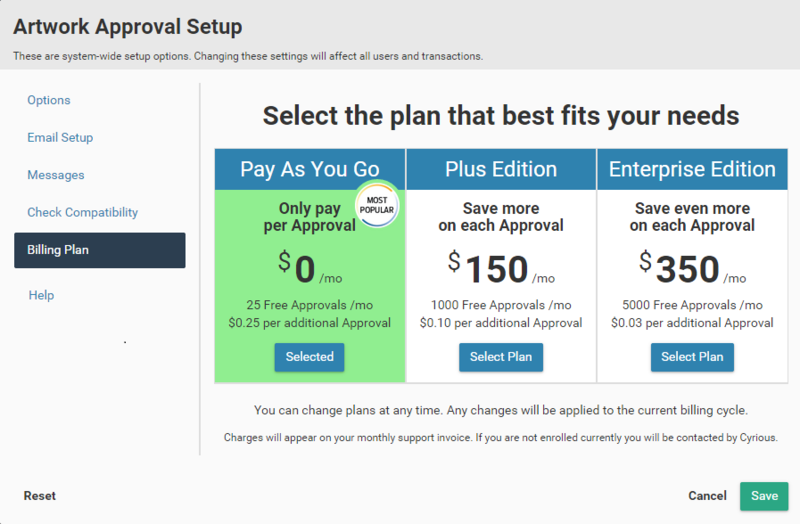 The Artwork Approval Setup screen is made up of 6 sections: Options, Email Setup, Messages, Check Compatibility, Billing Plan, and Help. Any changes made to these Setup options are system-wide changes; they will affect all users and all transactions. Let's discuss each of these sections in detail. 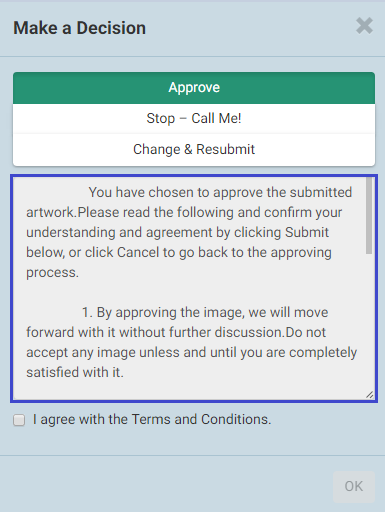 This option must be checked in order to use any aspect of the Artwork Approval feature. 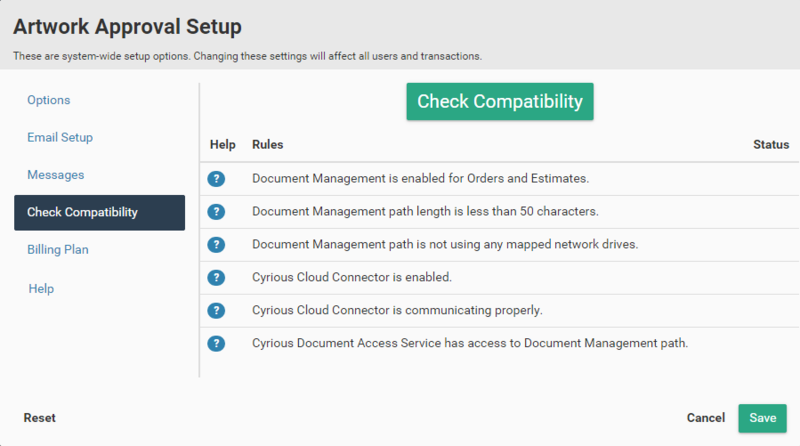 This permits your customers to be able to approve, reject, comment, and request changes through Cyrious' cloud portal. Artwork Approval can be used with this option turned off, but you'll need to manually change artwork group statuses and send proof approval emails to customers. No charges are incurred when this option is unchecked. 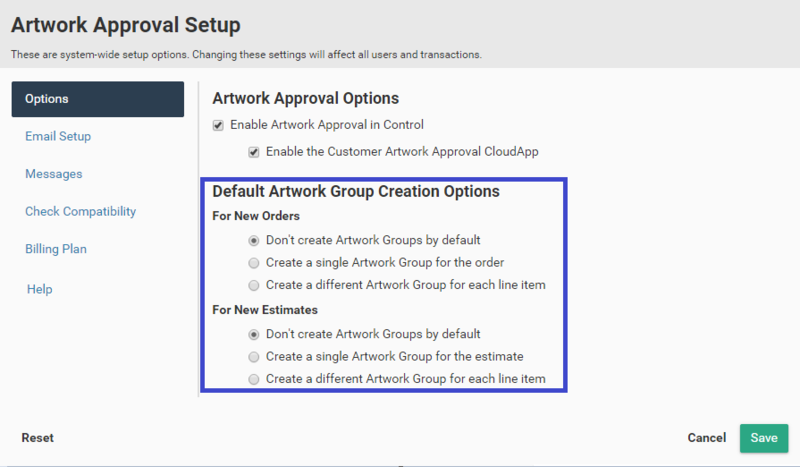 This setting will determine how Artwork Groups are automatically created for new orders and new estimates. Select the option that will be the default for all new orders and new estimates. Remember, you can always add new Artwork Groups as they are needed. This email account will be used specifically for emailing artwork notifications to both the Designer/CSR and Approver. The Approver (or Designer/CSR) should NOT be replying to the automatically generated artwork notification emails; however, to be on the safe side, you should probably enter an email address in the (optional) Reply To field so that no email slips through the cracks. Most customers use a generic email address like artwork@mycompany.com, proofs@mycompany.com, CSR@mycompany.com, etc… as the email account to send these automatic email notifications from. Note: Email Setup will ONLY appear as an option if the Enable the Customer Artwork Approval Cloudapp option is checked on the Options screen. Use the descriptions listed below to fill in your artwork notifications email settings. Hint: If you aren't sure what your email settings should be, look at your default Control email settings in Setup > System Setup > Email Options. The customer CloudApp has 3 blocks of text that can be customized: the Welcome message, the Approval Terms message, and the message on the Contact Us page. Note: Messages will ONLY appear as an option if the Enable the Customer Artwork Approval Cloudapp option is checked on the Options screen. This message displays when the customer first opens the Customer CloudApp. The default Homescreen Welcome Message is displayed below. If you would like to add your own custom message, click the **Use a custom Welcome message** and enter your message in the provided textbox. 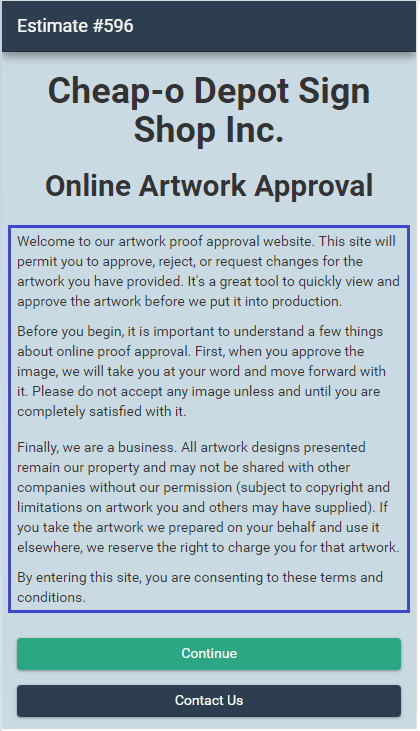 The Approval Terms Message is the text that is displayed when an artwork group is approved. 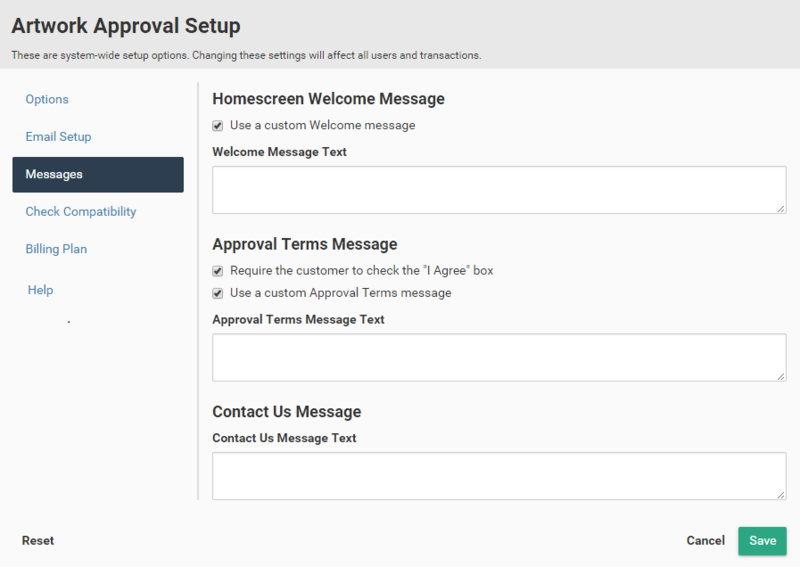 The default Approval Terms Message is displayed below. If you would like to add your own custom message, click the **Use a custom Approval Terms message** and enter your message in the provided textbox. 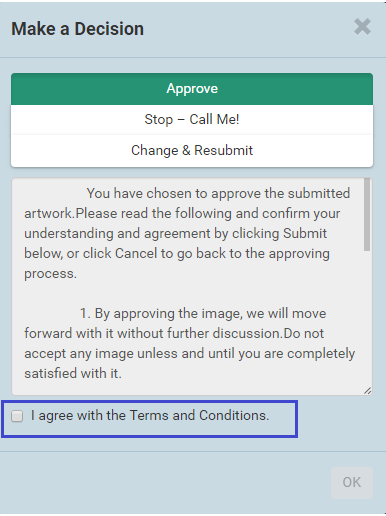 If you want to require the customer to check the "I Agree with the Terms and Conditions" option, make sure the **Require the customer to check the "I Agree" box** option is checked. 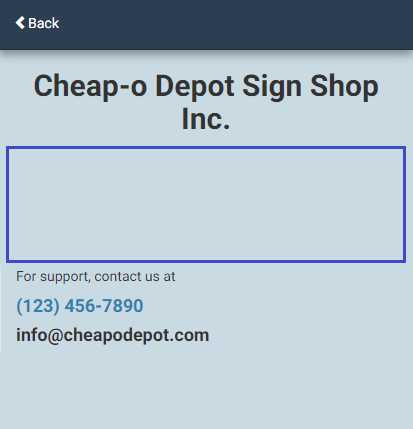 The Contact Us Message is the text that is displayed when the user clicks the Contact Us button. The default message is blank although your company's email address and phone number will display. If you would like to add your own custom message, enter your message in the provided textbox. The area provided for a message will expand as needed to fit your entire message and your contact details will shift down. If you ever need to run the Artwork Approval Compatibility test after you initially pass the test, you can always do that from the screen below. If you ever need to change the billing plan that you are on for artwork approval, go to the Billing Plan option on the menu. And changes will be applied to the current billing cycle. The Help option will direct you to the main Artwork Approval WIKI article. From there, you can select among many WIKI articles related to Artwork Approval.